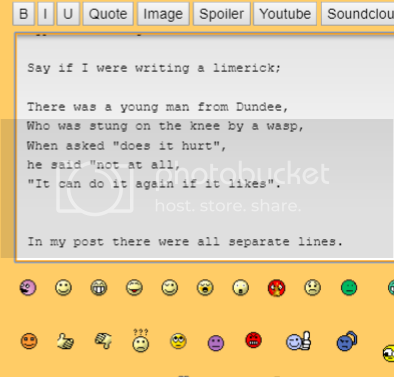 Why Is The Forum Eating Line Spaces? Why are the lines spaces in my post getting eaten? If I ask nicely, will you make it stop eating the ones at the ends of sentences too? For what purpose do you need more than 2 line returns? When writing paragraphs, if I place a fullstop then click return. On the posted version the next sentence starts immediately after the full stop, even though I typed it to begin on the next line. "It can do it again if it likes". In my post there were all separate lines. Ok will get it sorted later in the week. Dying with a cold at the minute. Do we need a few more syllables to make it a haiku? Please reword that to make it a haiku! No, there is no way to directly transfer haiku form into English as Japanese language uses "characters", rather then letter, syllables and words. and any one character can be 1 syllable, many syllables, or a word by itself. So when translating the character count(2-3-2 and 5-7-5 characters) into English do you do words? or syllables? etc. The representation I prefer the most is to use the character count in Japanese, as the number of stressed syllables in English (the accented parts of words). So the 2-3-2/5-7-5 characters per line, becomes that many stressed syllables in the lines of the English version. This makes the length of the poem in better keeping with the length of a haiku, and it helps trivialize the use of incidental unaccented English words such as "the" "a" "of", etc., The likes of which have no equivalent in Japanese. It's also traditional for Haiku's to mention nature and/or the seasons.